Chimichurri sauce is made with several ingredients that are perfect for roasting potatoes, such as garlic, olive oil, and parsley. 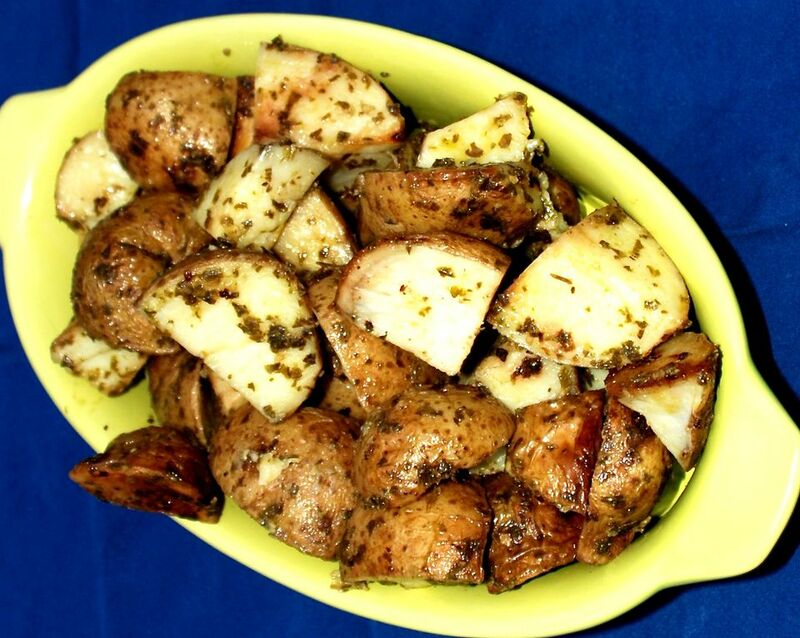 But it's the other ingredients in chimichurri sauce - lime juice, vinegar, and cilantro - that give these roasted potatoes something extra - great Latin flavor. Simply toss potato wedges with a generous amount of chimichurri sauce and bake - it's just that simple and quick. Preheat oven to 400 degrees. Line a 12 x 18-inch baking pan with foil. Scrub potatoes clean. Cut each potato in half, and cut each half into four quarters. Toss the potatoes with the chimichurri sauce, and spread them out in a single layer in the pan. Bake for 25 minutes, then check for doneness. A fork should be able to easily pierce the biggest pieces of potato. When the potatoes are golden brown and slightly crispy on the outside, and soft on the inside, remove from the oven. Season with salt and pepper to taste.